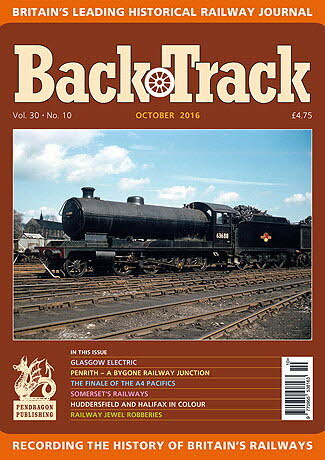 Railway Magazine | BackTrack October 2016 journal from Pendragon Publishing. 'Let's go Glasgow Electric': Part One - Geoffrey Skelsey considers the revolution in Glasgow's local rail transport. Penrith - David Joy tells the story of a bygone junction. Emile Bachelet and the dawn of 'Maglev': Part Two - Miles Macnair concludes his investigation into alternatives to conventional rail transport. For Heavy Duty on the Great Central - 2-8-0 goods locos photographed by Derek Penney. Somerset's Railways - A survey of the county's main lines and branches by Stephen Roberts. Deliver us to Huddersfield and Halifax - five pages of colour by Gavin Morrison around the West Riding centres. Sometimes an alternative will do - two examples in colour of horse and human motive power! Under and Over - archive photos of tunnels and viaducts. The Sharp, Stewart Locomotives of the Cambrian Railways: Part Two – John Reohorn completes his chronological survey. Railway Jewel Robberies - some cases described by Alistair F. Nisbet. Finale of the A4 - Allan Trotter presents a personal recollection of the farewell of this famous class in Scotland. The Railway in Court: Passenger Perils – Bill Taylor looks at a few random cases.